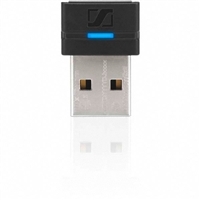 PC dongle designed to work seamlessly with PRESENCE™ and Mobile Business Series headsets. When used with the SDW 5000 Series base station, it provides connectivity to mobile devices. 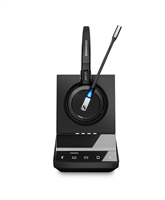 SD Office is a single-sided premium DECT wireless headset for desk phone and softphone. It features Sennheiser HD sound and voice clarity, noice-cancelling microphone, ActiveGard® and a choice of various wearing styles. Exceptional voice clarity and Super Wideband audio. Works with desk phones and computers. Exceptional voice clarity and Super Wideband audio. Works with desk phones, computers and Bluetooth devices. The MB 660 UC MS is a wireless, Skype for Business Certified, adaptive ANC headset designed for knowledge workers, demanding business-grade communication and premium Sennheiser sound quality. TeamConnect Wireless is a portable wireless conference system that provides excellent sound for online meetings. It is extremely easy to set up and host a professional-sounding online meeting in an instant in any room. The system delivers multiple connectivity options with any laptop, smart device or video conferencing system via Bluetooth, USB, or 3.5mm jack – its connectivity makes it a highly flexible asset that supports all your Unified Communications demands. The Case Set comes with 4 portable satellites and a portable case for charging and storing the satellites. It is a perfect solution for flexible meeting rooms having up to 24 participants. It’s made in Germany by Sennheiser.